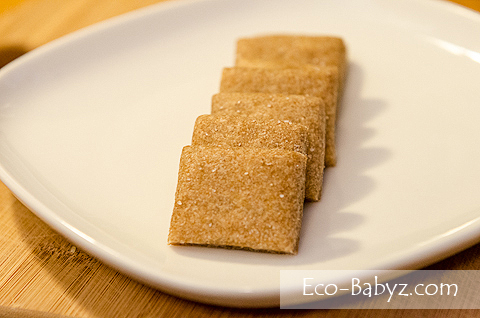 We used to get store-bought crackers regularly up until January of this year, yep, that probably didn't help much with Baby E's tooth decay or my sensitivity to gluten. 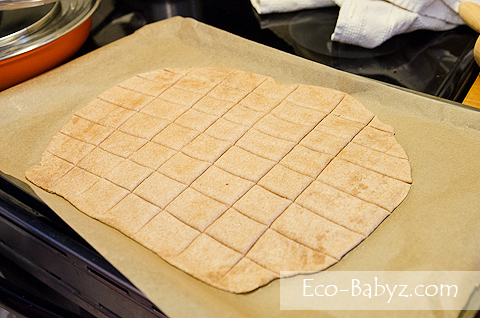 I've decided to take the plunge and make our own crackers from sprouted flour (see why sprout?). I have no problems digesting these! I've also used the same recipe for the Meatless Mushroom Pizza with Sprouted Crust. It's very easy, though a little time consuming when you can put three cookie sheets in the oven at once. Don't forget that you need softened (not melted) butter for the recipe, I usually set it out the night before I make the dough. I still try to limit crackers for the kids, I want them to be hungry at meal time. We do take these to the playground with us and on our walks, they are a life saver for a fussy toddler in the car - keeps Baby T content for all of five minutes. This below, my friends, perfectly illustrates my personality (irregular blob) in comparison to my husband's (orderly perfection). Not that he is perfect, he just likes things orderly around him. I could care less. So I try really hard for his sake! 1. 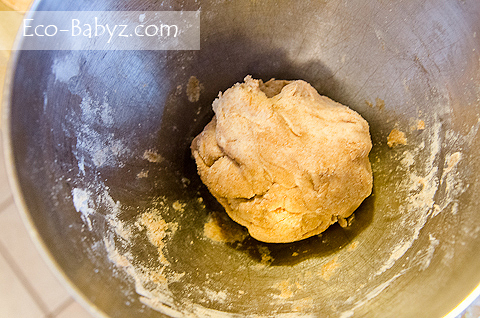 Day 1: Mix the ingredients in a large bowl and form into a dough ball. Leave covered with a towel and pan cover overnight. 2. Day 2: Divide the dough into 3 equal parts. Preheat oven to 350 degrees. 3. 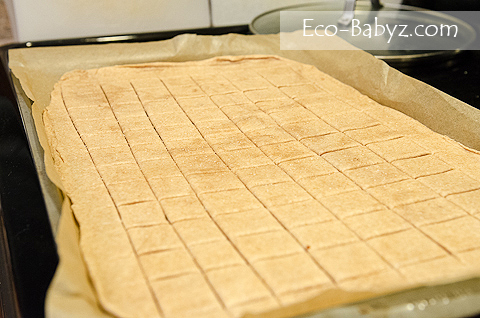 Roll out dough on a cookie sheet to about 1/8 of an inch thick, as thin as you can. 4. Score into crackers with a pizza cutter or knife. 6. Bake at 350 for 20 minutes. Rotate the cookie sheet 10 minutes in. Keep an eye on the crackers the last five minutes so as not to burn them. 7. Repeat all of the above with the other two parts of dough. 8. Enjoy with soup or salad, as a snack, or topped with more pastured butter! Ingredients contain affiliate links to where we usually buy them, your purchase supports Eco-Babyz at no extra cost to you. Thank you! Do you mean that sprouting the wheat berries yourself and making it scares you? :) It scares me too, so I bought some, lol. It looks pretty much just like regular whole wheat flour. This one was from Whole Foods, organic sprouted whole wheat flour. Thanks for sharing your link! So far i made seeds crackers, flaxseed, sunflower seeds and sesami seeds. I enjoy home made crackers. Where do you buy sprouted flour? That sounds yummy! My family isn't a fan of seeds in crackers, so I keep them plain. But I thought of adding dill, that would be yummy. Hubby bought the sprouted flour at Whole Foods, 5 lbs for $6.99 I believe (organic), sprouted spelt is $12.99 I think. I would do the sprouting myself, but it's a little time consuming and I would need a grain mill and dehydrator - I don't have anymore room for kitchen gadgets in our tiny town home!